(#GrandMarch4Oromia, 6 August 2016) Today, Oromia marches. To demand justice. To lament the suffering of its people. To mourn its dead. To voice its horror, anger, and rage in the face of an act of State terror. This is a march for peace, justice, and voice. This is a march for life. This is a march calling for immediate cease to the indiscriminate killing of our people, young and old, male and female, worker and farmer, everywhere. This is a march for freedom of the mass of Oromo bodies that have congested in Ethiopia’s jails. This is a march against torture of our citizens. This is a march calling for the dismantling all torture chambers and all repressive institutions. This is a march for government atrocities on people. This is a march of love–to denounce hatred, institutionalized and disseminated by the regime in power. This is a march against all forms of prejudice: ethnic, religious, and cultural. This is a march for civility and moderation within and beyond our borders. This is a march for equality of all peoples. This is a march for socio-economic justice. This is a march for immediate freeze of all acts, discourses, and acts of land grab. This is a march against the bureaucratic machine producing unnecessary suffering through eviction, demolition of houses, and dispossession of farms. This is a march for restoration of the evicted into their rightful places. This is a march for a consultatively determined, fair, and just compensation. This is a march against displacement, current and historic. This is a march against the dispossession of the poor to favour the rich. This is a march against the oppression of the powerless and the vulnerable to favour the powerful. This is a march to resist the dumping of urban waste on defenceless poor farmers. This is a march for a clean and pure natural environment. This is a march for social justice. This is a march for voice, for the people’s truth. This is a march to be heard. This is a march for rights. This is a march for our natural rights to life, liberty, equality-in-dignity, and security of the person. This is a march for our freedoms, freedoms to speak, believe, express ourselves, write, associate, assemble, and vote. This is a march for true, equal citizenship. 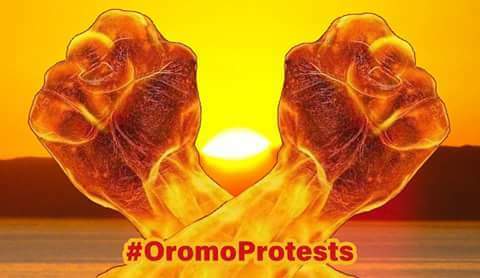 This is a march for self-rule of Oromos and all other peoples of Ethiopia. This is for an immediate stop to indirect rule through mercenaries, co-opted, corrupt, and unrepresentative EPRDF cadres. This is a march for a genuine federalism. This is a march for equal recognition of the identities of all peoples in Ethiopia, a march for the respect of languages, histories, cultures, traditions, names, and all its accompaniments. This is a march to call for recognition of Afaan Oromo as a working language of Ethiopia, co-equally with other languages, including Amharic. This is a march for our rightful title over the Oromo land including the cities of Addis Ababa and Dire Dawa. This is a march for affirmation of our dignity on our own land, the land that is the embodiment of life, sustenance, and sovereignty for us. Above all, this is a march for a just peace. This is a march that says NO to state-driven war against peoples. This is a march for rest in the land of our ancestors. This is a march for the state artilleries to be deflected from our peoples. We say NO to all forms of violence, atrocities, insecurity, and any manufactured miseries. We say NO to killings, and we disavow death! We march for life, its sustenance, reproduction, and flourish in a just, peaceful, and prosperous social order. Posted on August 5, 2016, in Uncategorized. Bookmark the permalink. Leave a comment.